Lake Mead is located on the Colorado River between the states of Nevada and Arizona, smack in the middle of desert land. Lake Mead is America’s largest man made lake, formed when the great Hoover Dam was built in the 1930s. It’s 112 miles long when the lake is full, 550 miles of shoreline, around 500 feet at its deepest and 247 square miles of surface. When it is filled to capacity it holds approximately 28 million acre-feet of water. Due to drought conditions of recent years the lake has not reached its full capacity in more than 10 years. Amazing Views, Gorgeous Scenery, Boating, Huge Fish…. ….enjoyed at Lake Mead every day. The first time I saw Lake Mead in 1972, I was captured and amazed by the deep blue color set in the midst of a desert landscape. When we were driving toward the lake I was thinking, “There’s no lake out here, this is all dry desert,” and then we popped up over a hill and there she was in all her glory, literally taking my breath away. Lake Mead has been the playground for movie stars, moguls and regular folks since it was formed by the creation of Hoover Dam in the late 1930s. There are huge catfish and carp in the lake, some people swear there are those as big as a human, but I’ve never seen them. As you stand on a dock at any marina, start throwing bits of bread or chips down into the water, and watch what happens. 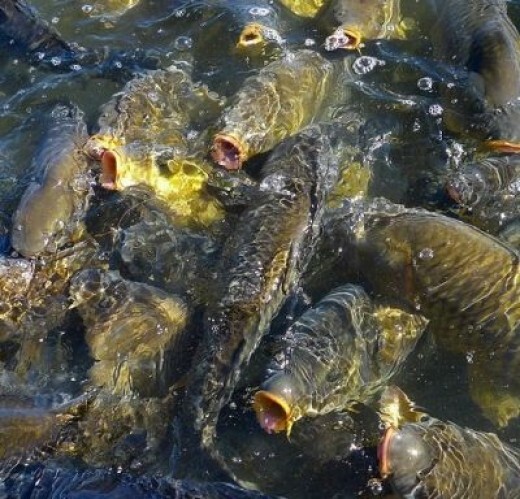 Soon you can enjoy watching as huge Carp vie for the food. Fishing and Boating is a big pastime for residents and tourists alike. 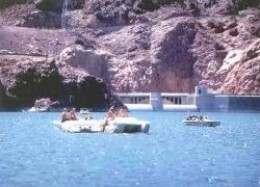 Some California folks tow their boats all the way to Lake Mead to spend holidays or week ends. The Story of How America’s Largest Man Made Lake Was Formed. How was Lake Mead formed and why? Do you wonder about the historical facts and stories behind the history? To see such a huge body of water in the middle of a dry desert is amazing. Read the story behind the creation of this tremendous undertaking and its purpose and what happened to those who worked so hard to accomplish this task. The story is available for purchase here. These Carp Know They’ll Get Fed! Notice the drop of the water line indicated by the white ring on the rocks. Notice the white line around the lake in the photo above? Those are rocks which used to be covered by water, now drying in the sun. This is what is known as Lake Mead’s “bathtub ring.” The level of the lake is receding as the drought continues. If there is such a thing as mourning for a lake, many Las Vegas residents are sad and in mourning. We remember the days when the lake was full, healthy and gorgeous. That’s changing because for the past number of years we’ve experienced severe drought. Drought is an extreme dry weather condition affecting every living thing. Lake Mead is still full of life, but if the drought continues to sap its strength, it won’t be for long. We are hoping for better winter snow falls and wetter monsoon seasons to help the lake regain its former glory. I have lived in Las Vegas, Nevada since the 1970s and I’ve seen a lot of changes. One of those is the drought conditions of the lake, another is the Mike O’Callaghan – Pat Tillman Bridge, also known as the Hoover Dam Bypass Bridge. The new bridge has made it easier for folks traveling back and forth for business, and tourists can still stop and look at Hoover Dam, without holding up traffic. Hoover Dam is a historic landmark in its own right, but now has the added glamor of the first concrete-steel composite arch bridge built in the United States. The Mike O’Callaghan – Pat Tillman Bridge has the widest concrete arch in the Western Hemisphere, is 840 feet high above the Colorado River. It is the second highest bridge in the United States, following the Royal Gorge Bridge in Colorado. Hoover Dam was constructed from 1931 to 1936 during the Depression. It put thousands of men to work, which was sorely needed. As the water of Lake Mead accumulated behind the dam, it forced evacuation of several small communities. Buildings of St. Thomas are now visible since the water level of Lake Mead has lessened. The video below shows the contruction and engineering marvel of Hoover Dam and Lake Mead. John Wesley Hardin: Bad or Misunderstood? Very interesting Nancy. That ‘bath-tub ring’ is something else! Very sad that the lake is decreasing so much! You’re right, the water in the photos is so blue and very beautiful – must be something to see in a Desert! It’s the reservoir for the water for entire west side of the country Barbara, and that’s the saddest part. It IS sad to see the beauty gone, but more importantly, we can’t survive without the water that’s held there. How bad is it going to get? Is the lake going to go dry? It depends on the Colorado River, and how much snowfall and rain it receives, in order for Lake Mead to increase its level. We’re hoping that will happen, but right now, the entire area is in a terrible drought, so it doesn’t seem likely. Thanks for your comment, my friend.